Non-stop flights from London to Mexico City from £439! Cheap flights from Milan to Kuala Lumpur already for €351! Qatar Airways promotion code: get up to 10% discount all flights from France! Some good option for travellers in the UK looking for some reasonable solution to Mexico based on promotion of their national flag carrier airline British Airways. Non-stop flights from London to Mexico City are now available already for £439 (€493). This is including travel dates over local summer which is considered as main tourist season in there…You can also depart from other airports in the UK with stop in London. There is slightly cheapesr solution with additional layover in Madrid (outbound flight only) but we suggest it is not worth it and this one is the most reasonoable solution..
Current British Airways promotion is valid for bookings made till 8th of August or until sold out. Travel period is then 30th of December 2018 to 23rd of March 2019. Based on date of your outbound flight from London to Mexico City. Max stay 12 months. Below you can refer to our booking and travel date samples. Travel dates. : Currently plenty of travel options are available for advertised rate. Flights over weekend are slightly more expensive. To compare lowest fares available you may check here with BA as they offer week´s view. 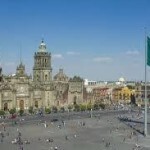 Booking sample of cheap non-stop flights from London to Mexico City from £439 below. In this case you would depart from the United Kingdom to Mexico on 26th of January. Your return flight from this usually fairly expensive destination in North America back to London would be then on 8th of February 2018. Enjoy this latest discount and book promotional flights on board of UK carrier British Airways.